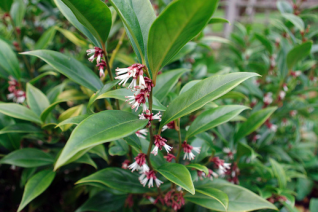 Purple stem Sarcococca is a slight improvement on this useful, fragrant, and durable evergreen shrub. Fine white flowers emit a strong sweet fragrance from late December to March. 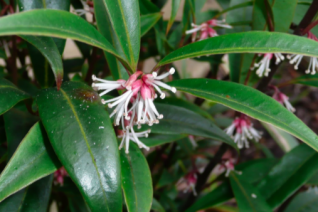 Slow spreading shrub that travels locally by suckers to form patches. To 2′ tall and up to 4′ wide if soil is rich, well drained and summer irrigation is reliable. Tolerates dense dry shade well. Black/red berries can follow the flowers into spring. Cold hardy to 0ºF. May burn in full sun- best with shade or at least protection from reflected heat- like an open north exposure. High deer resistance.